New research from the BirdCast team highlights risks of exposure to artificial light at night for migrating birds. We ranked metropolitan areas where birds are at the greatest risk of becoming attracted to and disoriented by lights. With the vernal equinox approaching, Team BirdCast welcomes back our forecast and live migration maps for the spring 2019 season! Hurricane Michael strengthened rapidly into a major hurricane on Tuesday, and as with previous storms on which BirdCast reported, it may have dramatic impacts on local and transient bird communities and their habitats when it comes ashore and passes through the Southeastern US. Live sightings will appear on the current observations map as they are entered into eBird, but as always, for those in the path of this storm, safety first! Real-time sightings from your eBird checklists will appear in this post's map, providing a unique opportunity to help us understand how these storms transport birds and how birds respond to extreme disturbances in their annual cycles. Hurricanes and their impacts, in particular in depositing seabirds far afield from their normal haunts, represent unique opportunities to understand how animals behave in and respond to serious disturbances. Hurricane Florence is no exception. 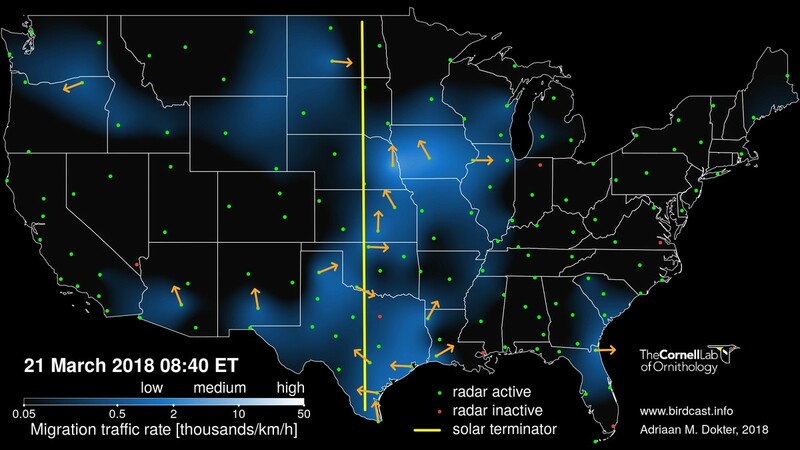 Real-time bird migration maps show intensities of actual bird migration as detected by the US weather surveillance radar network. All graphics are relative to the Eastern time zone.